Facing into yet another AIB Leinster Club Senior Football final – the Portlaoise Senior Football team are breaking new ground for a club experiencing continuing development on and off the pitch. Club Treasurer John Hanniffy said, behind the scenes Portlaoise GAA club are in the midst of the development of their new grounds and playing fields. The progress on the pitch is no accident, say Committee members who recognise that a strong support base off the field is just as critical for success. 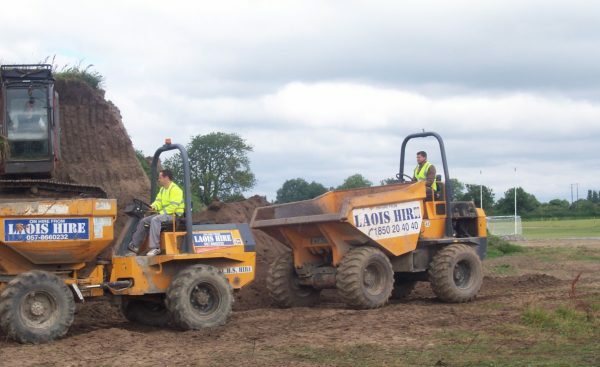 Club Players Colm Clear and Eamonn Fennelly using Laois Hire plant to lay the new pitches for Portlaoise GAA Club. our transformation off the pitch, especially by lending their support to the development of our new grounds. They’ve been hugely influential in helping to get us to a new phase of our facilities for our Club and our Community’’. 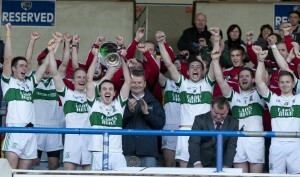 Senior Football Captain, Brian Mulligan, lifts the Laois Senior Football trophy aloft after Portlaoise defeated Arles-Kilcruise in the Laois County Final. 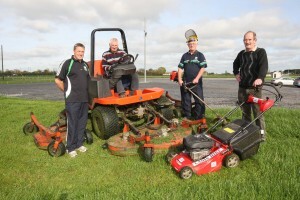 L-R: Club Chairman Vincent Dowling with Grounds Committee Members Ollie Byrne, Liam Breen and Kevin Culleton.